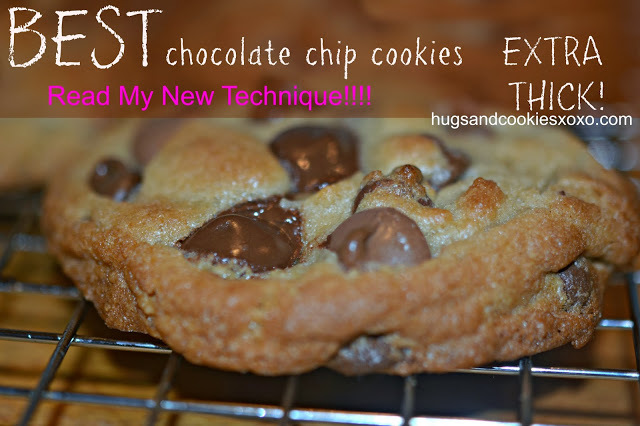 I AM SHARING MY SECRET FOR MAKING EXTRA THICK CHOCOLATE CHIP COOKIES!!! 1. Preheat your oven to 425 degrees. (I use the convection setting but regular will work fine). Chill your cookie dough at least 4 hours! 2. Measure your cookie dough to 2 ounces for each mound. 3. As soon as you throw the cookies in the oven, immediately shut the door and lower the temp to 375 RIGHT AWAY. My theory is that the high heat of 425 immediately "sets" the base of the cookie to be thicker!!! Bake for 9 minutes or until the tops are getting nice and golden. Will continue to set up while cooling on cookie sheets. This recipe produces a crisp outside and a thick, soft, chewy center!!! 1 cup NESTLE semisweet chips plus ½ cup bittersweet Ghiradhelli chips and ½c Ghirardelli Milk chocolate chips. Preheat oven to 425 degrees. Line cookie sheets with parchment. Beat butter and both sugars until well blended. Add in vanilla, egg and yolk until light and creamy. Add in flour, salt and baking soda just until incorporated. Chill 2 or more hours. Drop by 2 ounce mounds onto parchment. (If you like extra chocolate, place a few more chips in the top but beware that's a lot of chocolate!) Place in oven and IMMEDIATELY lower temp to 375. Bake 9 minutes or until tops golden. Let cool on cookie sheets. So, do you turn the oven temp back up for each batch? do you cover the bowl? with saran wrap? Do we repeat the oven steps over and over again for the baking the cookies? Whenever I use all butter my cookies spread and thin out. (hate) So did yours do that before you tried the temp trick? When making cookies, always use UNSALTED butter. Salted butter makes them go flat.I learned this thru trial and error. Chilling the dough after mixing keeps them from going flat. They go flat because the butter/ fat is room temperature. melissa-no, but this made them EXTRA thick!!! i have digital oven so i couldnt do this . id have to shut off and reset my oven for each tray . Clever!!!! I’m going to try this! I PLAY OUTSIDE-LET ME KNOW HOW U LIKE THEM!!! THERESA-MINE IS DIGITAL TOO-I RESET TO THE HIGHER TEMP FOR EACH BATCH! These look so good!!! They look similar to Dunkin Donuts chocolate chunk cookies. I have been searching for a recipe for so long… Can’t wait too try yours…. Thanks so much for sharing. 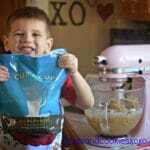 Do you use all purpose flour or self rising flour? THANK U!!! I USE ALL PURPOSE FLOUR. PERSONAL PREFERENCE! GO FOR IT WITH GHIRARDELLI!!! Can you tell me approximately how much 2 ounces is. I don’t have a kitchen scale. Thank you. Hmmm. How about a heaping tablespoon!!!! That isn’t necessarily true, Chrys. 8 oz of water takes up a lot less physical space than 8oz of flour. However, since we’re just talking about the size of the cookie, I wouldn’t imagine it matters much – they’re probably talking about the ice cream style swish-scoops. You should get a scale, Sue! I’m amazed at how often we use ours. How is 8oz of water different then 8oz of flour? Their both 8oz??!!?? 1/4 c is 2oz by volume, not by weight. Those are two different measurements. Always put your unbaked cookies on a cool baking sheet as well because the heat will melt the butter prematurely, causing the cookie to spread out. I read this somewhere and have been doing it ever since with success. Haven’t tried yor recipe but probably will for the g’children! When you take your 1st batch of chocolate chip cookies out of the 375 degree oven do you put the oven back to 425degrees until next batch?? Yes! Let it come back up to 425!!! LOVE Love Love! I made my cookies a bit bigger which just meant I kept them in the oven for a tad bit longer. 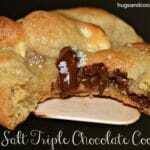 I also will add a smudge more salt next time but these cookies are absolute perfection! Thank you for your genius Idea with the temp! 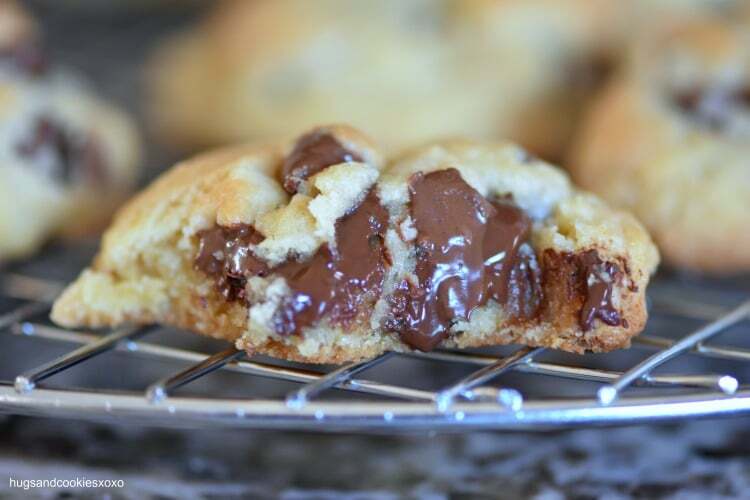 I use ghirradelli milk choc chips…even better!!! Use 3/4 cup sugar, both brown and white. Add 1/4 cup flour or up to 1/2 cup added flour. I am at 4500 ft altitude. I lived in Woodland Park CO, 9000 feet, and learned to put a pan with a little water in the oven when I baked things. You might give this trick a try. I lived in wp too! I live at 8800 ft. I bake them just the same as low altitude- making no adjustments. I usually at nuts and sometimes a large Hershey candy bar chopped up- symphony bars are also great! I live in the San Juan mountains of SW Colorado. I dont change a thing. They turn out great. Make sure you use the unsalted butter, chill well before baking, etc. I will bake these for a Bake Sale we are having at the High School where my daughter taught. think these will go over very well. I am so sorry to hear about your daughter. I hope these come out perfect for the bake sale. BIG hugs!!!!!! I too am sorry about your daughter. My son passed away 4 years ago from a brain tumor. When I read your post I felt prompted to reply to your message to let you know that I understand. I would be happy to chat with you if you ever feel the need to talk with someone who has experienced the loss of their child from cancer. I know this post was from last year but I just wanted to say so sorry for your loss. YUM! 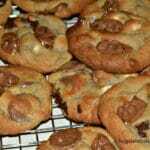 I love thick chewy cookies – I might add walnuts or macadamias .. YUM! Has anyone tried making them gluten free? If I just changed the flour to gluten free would it work? It will prob work as far as being yummy but my experience is gluten free come out thinner-may want to add a bit more gf flour next time. salted!! always!! Just my opinion! Someone said earlier that unsalted is best, I wonder which one is best too ??? There is only about 1/4 tsp. of salt in each stick (1/2 cup) butter so you can always add that much additional salt if you only have unsalted. I only buy unsalted, that way I can control how much salt we eat. do you pack the brown sugar or not. These are very good! My two little girls LOVE to bake, these are a huge hit! I put mine in the freezer for 30 minutes, instead of the refrigerator, I have anxious bakers!!! They turned out big and thick. PERFECT. Thank you for the recipe. Hello every one! Thank you so much for the tips. My choc. chip cookies have been so flat, I have to use a razor blade to get them off the cookie sheet. Had to laugh…we somehow missed the part about the “refrigerate for at least four hours” and baked them immediately. They were still incredibly good just not as thick as expected. Will follow ALL of the directions next time and I’m betting they will be perfect! Thank you for sharing this terrific recipe! Wow!! I just pulled mine out of the oven and they look exactly like the pictures…and they taste SO GOOD! Thanks for sharing this recipe, it’s wonderful! I made it exactly as written and used my baking stone. What size scoop makes 2 oz mounds of cookie dough? I like to use a 40 for good sized cookies. I don’t think the 40 would be 2 oz, though. I use my food scale to weigh. My trick is make up the dough, shape into balls and freeze them. When you need a batch, remove what you need from freezer and preheat oven. Bake for the recommended time. Centers come out chewy and soft! Works every time . I made these last night! These cookies rock! 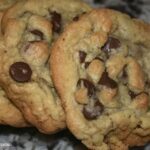 This is now my only chocolate chip cookie recipe!! Thanks so much for sharing!! I am so happy you agree!!!! Yay!!! These cookies are fantastic! I love the use of kosher salt. They took around 15 minutes in my oven (older gas stove) on an air bake cookie sheet. Crispy on the outside and chewy in the middle. So addicting! do u always use your convection oven for baking?? I like it for cookies. If I wanted to make smaller cookies what would be the recommended baking time? Hi can I use gluten free flour to make these? I would recommend Cup4Cup gluten free flour. I ended up using cup4cup and they came out great! They were literally the best cookies ever and who knew they were gluten free! Awesome!!! Isn’t that the BEST gf flour????!!!! Yes! Actually stumbled on this trick by accident. Totally works! They are the best ever! I didn’t chill them because I was too hungry for them! Thank you for an awesome recipe! Love that word. hhahahah Thanks! I added oats, pecans and cranberries about 1/4 cup each. The cookies taste great. I did everything else as posted. Is this dough supposed to be dry and crumbly or did I do something wrong? Hi Everyone when you say soft butter are you talking about room temperature? That isn’t true about always using unsalted butter. I always use salted butter that is melted. Refrigerate the dough for at least 3 hours and make the cookies taller instead of wider. Also another trick to super soft cookies is adding 1 1/2 tsp cornstarch. Your cookies look awesome to and I’m gonna have to try them. Since you usually lower the temperature by 25° when using a convection oven, do these bake at 450° when using a regular oven? Also, can you use all semisweet chocolate if that’s all you have? You can use all semisweet and I would still try 425. Hello! You mention that you used convection to make these. Did you use the same temperature and time that is listed in the recipe? Or did you adjust? We have a new convection oven, so I’m still getting used to using it. But most things I see say to either reduce the temperature or reduce the time for recipes. So I was just wondering what temperature and time you used for convection. Is that a tablespoon of vanilla? Seems like that is too much, I just want to be sure. What brand , type flour did you use? THE BEST! I THANKS FOR sharing! Excellent!! Didn’t have 4 hrs to chill so I scooped them into balls and In fridge for 2 hrs. Worked perfect!! another trick I learned years ago, add an extra cup of flour and also 1 tsp baking powder. 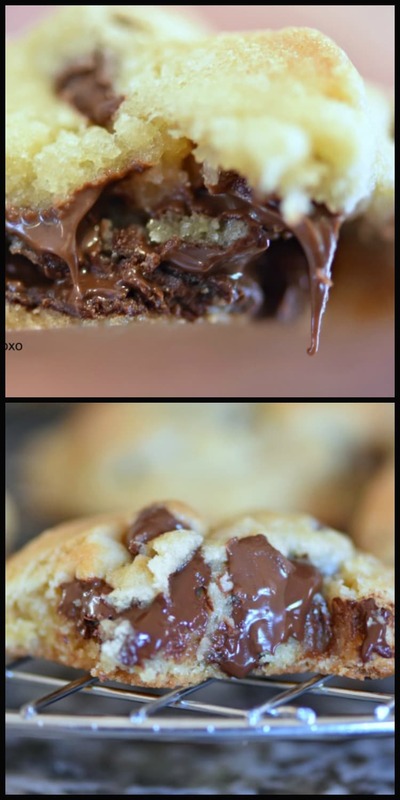 You will also get thick, chewy cookies by doing this.